Managing a small business can be quite hard sometimes. There are so many things to figure out and so many details to prepare that will ensure both your employees and clients are happy and satisfied. However, no matter your expertise, it is crucial that you invest in IT support to ensure your business runs smoothly behind the scenes. While at first, it may seem that hiring new network consultants can be a bad investment for a small business, the benefits cannot be argued. Here are some of the best reasons why any small business should invest in an IT consulting company. Forbes magazine recently reported that four out of five small businesses will soon rely on cloud computing. This relatively new idea is known for its efficiency, accessibility, and cost-effectiveness, but can be quite hard to grasp at first. So for the safety of all your secure information and data, it is wise to invest in a professional. The digital world is transforming every single day, and it can sometimes be too overwhelming to stay on track of everything. This is where networking consulting comes in. It is their job to stay up to date on the trends after all, so you won't be left in the dark! With the help of a professional IT consulting company, you won't have to worry about handling confusing algorithms or completing difficult updates. Do you feel like you're in a rut, and no matter what you do, nothing gets better? Well working with an IT professional can help solve some of your problems in that they can take an unbiased stance on exactly what is working for your business and what isn't. Sometimes all you need is a neutral opinion to get the best results for your company. Above anything else, a professional IT consulting company can give you ultimate peace of mind. Nothing beats knowing you have a professional who can handle the complexities of technology behind the scenes while you run the show! With these benefits in mind, what are you waiting for? Our IT consultants are here ready to help. Switch to a VoIP Phone System and Save Big! A growing service for personal and professional use alike is that of VOIP solutions. It's particularly popular among small businesses who are looking to either choose a new phone system or update their old one. 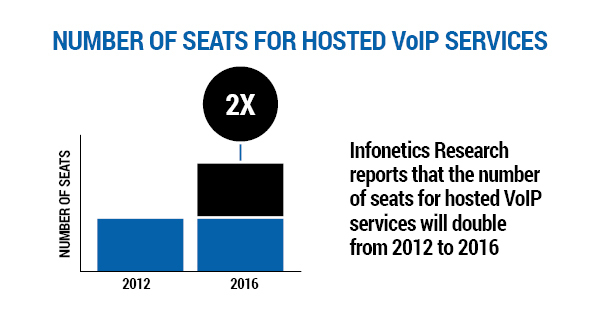 Indeed, Infonetics Research reports that the number of seats for hosted VoIP services will double from 2012 to 2016 and in 2017, the number of mobile VoIP users is supposed to hit one billion. So why are so many businesses looking into VoIP phone solutions? There are a number of benefits to using VoIP providers instead of a traditional phone system that can be attractive to small businesses in particular. Can You Explain What VoIP is? VoIP stands for Voice Over Internet Protocol, which basically breaks down to mean that you can get your phone service using the Internet, instead of through your phone company. Of course, this means you need a good Internet connection, but most businesses make that a priority. Okay, So What are the Perks to Looking Into VoIP Solutions? If you have a traditional phone system, you also probably have a closet full of wires, phone lines, phone switches, and the other necessary physical items needed to run the system. With VoIP, which runs over the Internet, you can nix that phone closet and use the space for something else. You can also say goodbye to the phone technician and the associated costs of having him or her come and fix whatever piece of hardware had an issue. With VoIP, any new changes or updates that occur with your phone system are automatically included and installed into your system as they occur, eliminating the need for a technician to come out and set it all up. No more poring over complicated user manuals or wondering what went wrong this time. Is it frustrating to miss calls while you're away from your desk or traveling? With VoIP solutions, you can get calls to your line anywhere, as long as you have an Internet connection -- which most people do now, thanks to phone data. And even better, long distance calls through VoIP are less expensive than phone calls done via cell phone. If you're the ultimate multi-tasker, using VoIP solutions is going to be right up your alley. You can add e-mail, e-faxing, remote conferencing, and other applications to your VoIP system in addition to telephone access. This means you can be doing a host of other things while you talk on the phone -- a working dream. VoIP solutions are also less expensive than traditional phone systems in a variety of ways. Not only can you cut out your phone bill and just pay the Internet bill, you also cut out maintenance and technician costs, as discussed above, and save on long-distance calls. For a small business focusing on allocating funds, using a VoIP solutions provider can be the perfect solution. How Do I Get Hooked Up With VoIP? Get in touch with your Internet provider. Many companies have seen how lucrative offering VoIP can be and may be able to offer a package that bundles your Internet service and VoIP together. There are also providers that specialize in just VoIP services. A quick Internet search will yield you a host of companies who can get you started with VoIP. Depending on if you want cloud-based VoIP companies or features like automated voice systems and conference calling, you'll want to cross-check each company and compare to see which has the most advantages. If you use an IT support company for your computers and other technology, see if they have technicians who also help with VoIP troubleshooting -- though VoIP is significantly more user-friendly, it's always good to have an expert on hand, should you need one. Make the switch to a VoIP service today and enjoy an easier to use phone service, reduced costs, and better functionality. What's not to love? Technology is everywhere, and more and more businesses and consumers are relying on the Internet for everything and anything. Since the world of technology and the Internet is constantly changing, there is more of a need than ever to invest in IT consulting for your small business. Not sure if your company is in need of network consultants? Here are some red flags to consider. Are you constantly frustrated with your server shutting down or spending a lot of valuable time updating? Have you missed multiple messages from coworkers, which compromised your productivity? Communication is extremely vital in any business, and an it support firm will be able to set up different methods of communication that will work best for your specific business. It is no secret that technology changes incredibly quickly. There are new updates to be installed regularly, and if they go unnoticed, your operating system will suffer. IT consulting will bring you in touch with new, updated technologies such as cloud computing or a VoIP server. They will also be able to offer guidance of what direction you should be going with these new technologies, and considering that the amount of mobile VoIP users will reach 1 billion by the year 2017, this is incredibly important. At the end of the day, there is no use in having updated technology in your office if your employees cannot use it properly. But the best training comes from professionals, so if you would like everyone to be on the same page, simply set up a training session with our IT support office and we will handle the rest! Do you feel as if your company is dated and out of touch with your customers? This may be the case, but no worries as a simple network consultant can fix this quickly! They will be able to see what you are doing right, what could use some improvement, and what practices need to be stopped immediately. Does your company need some IT consulting? Look no further than MVP solutions -- call us today for a quote! Search engine optimization can be an especially powerful tool with a little bit of dedication and persistence. However, it is much more than just keyword stuffing, and more about creating quality onsite content. The goal of content on your web page is more about piquing your customer's interest and giving them helpful information and considering that users will only read slightly more than a quarter of the content they see on the web page, you want to make it good! Here are some IT support analyst-approved tips on how to create the best onsite content to boost your SEO. It is important to know your audience so you can write information that is relevant and easy to understand. If you are unsure, always assume they are complete beginners, and start out by writing introductory articles. Some good ideas include the 101s of X, X for beginners, a glossary of X, and what to know before investing in X. After writing these, you can easily move up to more experienced content. Your potential customers will most likely have a lot of common questions if they are new to your site. So to make it easier, keep a separate tab for FAQs. Doing so will also boost your search engine optimization because you will most likely be incorporating crucial keywords to your business/services. Many users think that pictures won't add to their search engine optimization plans because pictures don't contain any keywords. But, pictures are actually worth a thousand words! Having pictures and other forms of media on your site can be especially beneficial not only for giving the customer more context and information but because they look enticing. And the more updated your website looks, the more intrigued customers will be, and the longer they will stay! 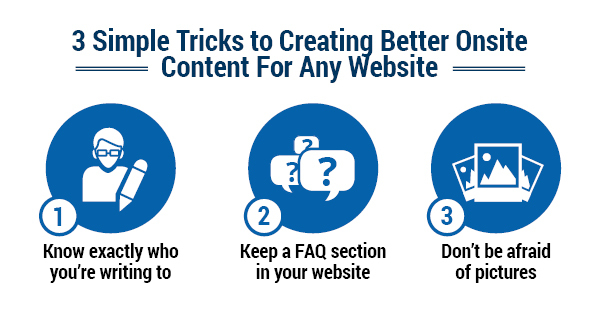 Follow these tips, and your onsite content will soon flourish! If you are in need of any networking consulting or interested in learning more about SEO in Buffalo, contact our IT support firm today. Is your website easy to maneuver? Does it work across mobile platforms? Are you receiving regular traffic and traction? It's important to ask these and other questions since you're in business to succeed. Were you aware that you have 10 seconds to make a positive impression on potential customers? In some cases, however, you may only have 3 seconds to make that first impression. According to eConsultancy, this is because 40% of your visitors may be abandoning your webpage if it takes longer than that to load. Since there are even more users accessing the Internet via mobile devices such as smartphones and tablets, having a website that works across platforms is essential. 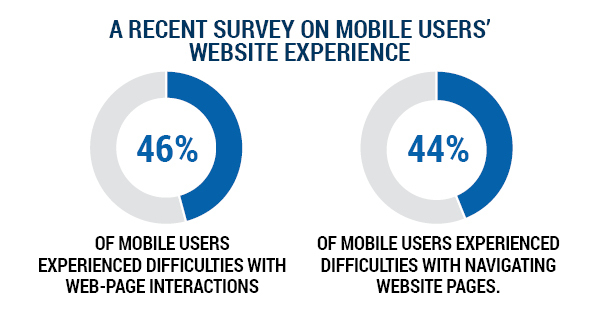 A recent survey showed that 46% of mobile users experienced difficulties with web-page interactions, and 44% experienced difficulties with navigating website pages. You want their experience to be seamless, right? When visitors are at your website, they want to know why they are there. Basically, this relates to your business purpose, mission, and what products and services you can offer them. Furthermore, since these potential customers rarely read more than a quarter of your website's content, you want that content to keep their attention. You also want them coming back for more on a regular basis. You're probably aware that you need to have fresh content cycling through your website. If your visitors see the same content every time they visit, they may just take you out of their bookmarks. If you do cycle your content on a regular basis, and still aren't receiving much traction, you probably need search engine optimization services. When an SEO specialist provides you with SEO solutions, your website will have greater visibility. The result? You'll attract the types of customers that you want. Are you making effective use of cloud services? If you're not sure, you may want to schedule a consultation to learn more about how cloud computing services can make a difference in your overall business operations. Depending on your business needs, there are a variety of cloud computing solutions available. If you're not that familiar with cloud services yet, PC magazine explains it quite well. Basically, rather than storing your data and programs on your hard drive, they're stored on the Internet, according to this recent article. If you would like to learn more about web development and cloud computing services, contact us today.